What’s Different with this Electric Catfish? 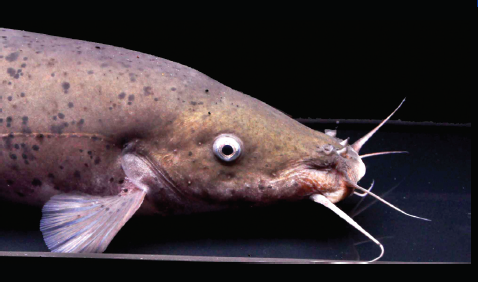 When people talk about the Electric Catfish, what comes to mind is the Malapterurus electricus. 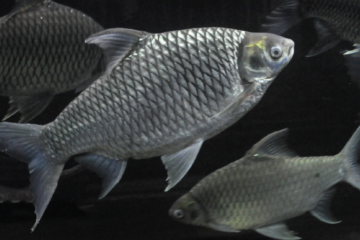 Fishkeepers in the Philippines may have learned about this fish some 30 years ago when first imports came into the country via the aquarium trade. Since then, that was about the only species Filipino fish hobbyists have ever kept.Surprisingly, there are currently about 18 recognized species in the genus Malapterurus. Sometime about a year ago, I found one Electric Catfish that looked a bit different. As it turned out, it was indeed a different species, the Malapterurus microstoma. M. microstoma is referred to as the Smallmouth Electric Catfish. Other literatures refer to this as the Dwarf Electric Catfish. Personally, I don’t think the term “Dwarf” is quite appropriate as it grows to about 21 inches or 55 cm. Based on its looks, “Smallmouth” seems more appropriate. The discovery of the M. microstoma is attributed to a pair of Belgian ichthyologists who worked in Africa, Max Fernand Leon Poll and Jean-Pierre Gosse. They described this species of Electric Catfish in 1969. Like all species in the genus, the M. microstoma possesses the ability to generate electricity and to trigger this when hunting for food to paralyze its prey and when defending itself from predators. This is quite a strong jolt. When I wrote about the M. electricus many years ago for this magazine, I had a 4-inch specimen and deliberately held on to it to experience how strong the electricity it can release is so I could share this with my readers. It was a shocking experience! I placed the small catfish in a plastic bag and grabbed on to it. Instantly it zapped me, so I quickly pulled my hand from the bag. It felt like hitting my funny bone hard, and the electricity caused some numbness in my whole arm. A few years back, there was this fish hobbyist who contacted me and insisted on trying the power of the M. electricus. I told him about my unpleasant experience but he decided to take the challenge. So I put the M. electricus in a plastic tank when he arrived. The M. electricus at this time was no longer the small 4-inch fish I held on to, but by then a larger 7-inch fish; and as all literature says, the bigger they are, the stronger electricity they can produce. So this brave guy walks up to the tank and grabbed the fish while his girlfriend was video recording the episode. As expected, he was electrocuted and yelled expletives not fit to be written in this article. Well, he survived, but walked out shaken.This time around, I am no fool to test the power of my 12-inch M. microstoma. Let us be content with what research says: that Electric Catfishes can generate up to 300 volts of electricity. That is much more than the 220 volts of electricity we have in the power outlets of our homes. Catfish of the genus Malapterurus are restricted to the African continent, and M. microstoma is native to the Congo River basin of Central African Republic, the Democratic Republic of the Congo, and the Republic of the Congo.Like most species in the genus, the body shape of the M. microstoma is elongate. It looks like a fat sausage with whiskers at the end. It has a big tail, a fleshy dorsal fin located near the tail, and a pair of horizontally based pectoral fins placed low on the body. The body color is brown to brick red and adorned with black spots. • First, taking a cue from its common name, the most obvious of these Key Distinct Features (KDF) is the small, sharp pointed mouth of the M. microstoma. The mouth of the M. electricus is bigger and more blunt. • Second, while they are both sausage-like in body shape, the body of the M. microstoma is slimmer and appears longer than that of the M. electricus. • The body is also covered with tiny black spots in the M. microstoma, while the black blotches in the M. electricus are bigger. The M. electricus usually has black and white bands located at the peduncle or base of the tail. These bandings are not present in the M. microstoma. • The tail of the M. microstoma is also much bigger than that of the M. electricus. The tail is the same color as the body, with a medium thick white band at the margin of the tail. The tail of the M. electricus, however, is generally white with a dark stripe near the tip and white margin. • The eyes of both species are small in relation to its big and elongate body. But the eyes of the M. microstoma appear to be bigger compared to those of the M. electricus.Keeping the M. microstoma in an aquarium is easy. It is a hardy fish and may easily be kept by anyone with average fishkeeping skills. You need not be an expert aquarist to successfully keep one. The first thing to consider is that it should have its own tank. It is strictly a single-fish-in-a-tank kind of fish. Any tankmate will surely be electrocuted and killed. Luckily, it does not require a large tank as it mostly just sits around in one corner. It does not swim actively and once it has found a territory in the tank, it will spend most of its time settled in that area. 20 to 50 gallons can be good enough for most specimens, and a 75 gallon tank should be more than enough for the large ones. Filtration is not really critical. 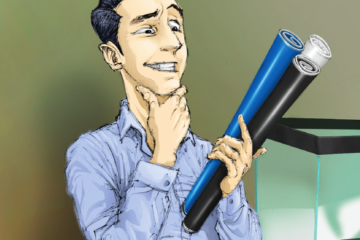 You can make do with a sponge filter, but you may have trouble when the air hose comes loose from the sponge filter. You must find a creative and safe way of reattaching the two without getting electrocuted.Maintenance, however, is critical. A weekly water change is a must to keep the water in good condition, especially since this fish is a heavy eater and will create a lot of bio waste. Therefore, frequent water changes will greatly limit ammonia, nitrite, and nitrate to safe levels. It is also best to maintain water pH within the 6.0 – 7.0 range and temperature at 23.0-30.0°C. Avoid the extremes and M. microstoma should do well in your aquarium. Feeding is not a problem as it will take any meaty food. Some learn to eat commercial dried fish food, but these must sink to the bottom as M. microstoma is a bottom dweller and rarely goes to the top. Offering live fish or shrimp is quite a show. When offered live feeder fish, you will see the fish get stunned and then the M. microstoma will gobble it up. If offered live shrimp, the shrimp will jump out of water and may get away if it is not hit hard. Keeping the M. microstoma is very easy. However, the fishkeeper must be mature enough to respect its ability to electrocute. The chores around the tank must not be taken lightly. Be aware that you cannot treat it like you do other fishes because you can get hurt if you are not careful.A tank with M. microstoma is a nice conversation piece at home. It may not score high in the looks department but surely guests will be amazed by the fact that it has electricity. To the non-believers who would try to find out the truth of this for themselves, don’t ever say I did not warn you. This could be an electrifying experience! If you have any questions or inquiries about the fish discussed here or if you wish to have your fish featured in this column, please write Angel Ampil at AngelAmpil@yahoo.com. This appeared in Animal Scene’s February 2015 issue. Black, White, or Blue? Does the Color of Your Tank Matter?